Two Chevrolet small-car concepts share the stage at Detroit, and both are far-out concept cars in the classic sense—not much more than three-dimensional renderings, and lacking interiors at this point. But of the two, the boxy 130R Concept definitely generated the most excitement among the motoring journalists present at these concepts’ debut. Breaking away from convoluted, organic shapes, the 130R revisits the idea of a simple, upright four-seat coupe with relatively straight bodysides—in the vein of the BMW E30-era 3-Series or the old Fiat 124. Appearing in a new red-metallic paint scheme, with matte anodized gold wheels, flared fenders, and a low front fascia, the concept strikes the pose of a weekend race car in some respects—with a Chevrolet crossflag emblem giving a nod to the brand’s performance heritage. Under the hood of the rear-wheel-drive 130R is a 1.4-liter Ecotec turbocharged engine, making about 150 horsepower and working together with eAssist technology to boost gas mileage by shutting off the engine at stops, providing supplementary torque boost during acceleration, and recapturing some braking energy. Just as with the companion Tru 140S Concept also shown for the first time at Detroit, the Code 130R will offer “sedan-sized functionality,” with reasonable back-seat space for two, and “innovative storage,” with a possible production price that could begin in the low $20,000s range. Connectivity will also take center stage, with the idea of users able to take their devices along with the vehicle as a WiFi-enabled docking station. 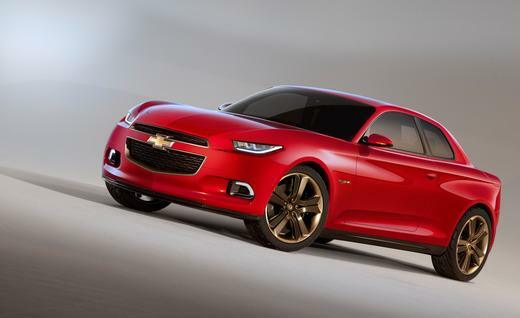 Should GM build the 130R? Tell them what you think; the automaker plans to take this concept, as well as the companion Tru 140S Concept, on the road this year to auto shows, campuses, and events—and turn to social media—to engage with young customers and gauge interest. Check back for more live photos from the show floor, and in the meantime, read about Chevrolet’s other small-car concept, the Tru 140S.